Hopkins Interactive links prospective Homewood students to blogs by both current students and the Admissions staff and also to the JHU Message Board. The national "blogging" wave has hit Johns Hopkins' shores as several schools have turned to the popular Web instrument as a way to illustrate undergraduate student life. In December, the Office of Undergraduate Admissions for the Homewood schools launched Hopkins Interactive, a site whose centerpiece is a collection of blogs in which current School of Arts and Sciences and Engineering students document their day-to-day lives, everything from the classroom experience to the weekend scene in Baltimore. The School of Nursing went live just after Thanksgiving with its own blog site, in which eight nursing students write, too, about all aspects of their lives at Johns Hopkins. While Peabody currently does not have a blog page, the school recently launched phase two of its Web site's redesign and now has blog capability. The school hopes to develop a student-run blog page in the near future. For the uninitiated, a blog (short for Web log) is an online diary or journal. Like a diary, an entry can be long and profound, or short and to the point: "Woke up today. Skipped breakfast." Daniel Creasy, an e-recruitment specialist and senior assistant director in the Office of Undergraduate Admissions at Homewood, said that blogs have become the newest trend in admissions nationwide as they help put a human face on a university. "For us, the blogs can help dispel some of the myths about Johns Hopkins as they allow prospective students, or recently admitted ones, to see the university through a student's point of view," Creasy said. "There are so many similarities between colleges when you look at just the printed admissions materials. It's only when you visit the campus and hear from students that a clearer picture starts to take shape. These blogs will offer a look at Hopkins that [prospective students] simply can't get through a guidebook." The Hopkins Interactive site, created for and by students, touts a view of Homewood from the inside out. Michelle Brown, a sophomore neuroscience major, said that one reason she agreed to keep a blog was that she recalled how difficult it could be to obtain some personally specific school information when she was a high school senior, like exactly how the school's meal plan would work for her, or whether its combined degree program would meet her career goals. "When you are on the outside, it's not always clear how things work. So it's useful to hear from someone who has already been through the process or is in a program that you're interested in," said Brown, a Florida native. "Also, I knew there were many misconceptions about Hopkins, like this is where fun comes to die and we're all pre-meds. But in my case, I'm involved in a lot of things, both academically and socially. This is a great place, and I'm having a really good time. I wanted to share that." So, what goes into each entry? Brown said her inspiration simply comes from her daily experiences. "I guess now I've made my life so that I see things and ask, is this blogworthy? " Brown said. "I might be at a concert, sporting event or in an interesting class and think, this would be an interesting or fun thing to write about." One of Brown's entries talked about the vast array of Johns Hopkins T-shirts available; another mentioned a band of student Christmas carolers who paraded around campus during finals time. Another student's blog detailed a recent road trip to a debate tournament, while yet another talked about a recent shopping experience in Charles Village. The Homewood schools currently have eight hand-selected bloggers: four freshman, three sophomores and one junior. Creasy said he wants to cap the number of active bloggers on the site at 12 and that there will be some regular turnover as students graduate and move on to other things. Like most blogs, each entry has a "comment" link, allowing for an active dialogue between the author and the reader. 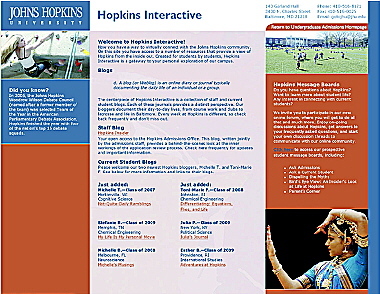 Hopkins Interactive also features Hopkins Insider, a blog written jointly by the admissions staff that provides a behind-the-scenes look at the application review process. In addition, the site offers a link to the Johns Hopkins University Message Board, where people can post comments on a myriad amount of Hopkins-related subjects, from student housing to how to start a club. Bill Conley, dean of enrollment and academic services at Homewood, said that the new site is all about simplifying and humanizing the message to students. "It isn't rocket science to observe that prospective college students spend countless hours surfing the Internet in search of the perfect college. They want to hear student voices, not the Madison Avenue speak of admissions officers," he said. "Hopkins Interactive connects [high schoolers] with real Hopkins students who are honestly talking about life at Homewood. The site conveys a feeling of positive energy and community at Hopkins." At the School of Nursing, the communications and admissions offices teamed up to create a blog site that shows the diversity of the student body and the academic program. The nine-member blog group includes undergraduate and graduate students, men and women, a past Navy Hospital Corpsman, a new father, a Returned Peace Corps Volunteer, the president of the Student Government Association, the president of the school's chapter of the National Student Nurses' Association and the vice president of the Black Student Nurses Association. SoN administrators said they wanted more of a student presence on the school's Web site and felt that blogs would fill that need. "Reading the blog of an actual student at the School of Nursing can give a prospective student information that no admissions officer can convey," says Mary O'Rourke, director of admissions and student services. "Today, more and more prospective and recently accepted students are relying on blogs to learn about the academic challenges of nursing school, extracurricular activities, volunteer or work experiences and what everyday life is like for a Hopkins nursing student." The Nursing blog pages also feature RSS (Really Simple Syndication) technology, which allows users to subscribe to the site and be notified when the student bloggers update their journals. Says O'Rourke, "Through a blog, outsiders can learn what it's really like to be on the inside of a Johns Hopkins nursing education. I hope that they read it, identify with the student and say, 'Yes, I can do this too.'" To read the School of Nursing student blogs, visit blogs.chatuniversity.com/jhuson. For the Homewood site, go to apply.jhu.edu/hi. Kelly Brooks-Staub contributed to this article. GO TO JANUARY 30, 2006 TABLE OF CONTENTS.